A Texas nurse who survived Ebola says she will file suit against her employer, claiming the hospital where she worked and its parent company failed her and other employees as they dealt with the first diagnosed case of Ebola on US soil. In an interview with The Dallas Morning News, Nina Pham said she continues to suffer from body aches and insomnia after contracting the deadly disease from Thomas Eric Duncan – a patient she cared for at Texas Health Presbyterian Hospital Dallas, who was the first ever man to be diagnosed in the United States with Ebola. He passed away in October in Dallas. “I wanted to believe that they would have my back and take care of me, but they just haven’t risen to the occasion,” Pham said. Pham plans to file her lawsuit on Monday against Texas Health Resources for alleged neglect in light of the hospital’s poor training, lack of proper equipment, and violations of her privacy. All of the above made her “a casualty of a hospital system’s failure to prepare for a known and impending medical crisis,” according to the interview. Pham said that staff who treated Duncan were not given the right protective gear and needed more training. “We don’t want nurses to start turning into patients,” she stressed. She described the chaotic atmosphere she had to work in, as well as the lack of guidance coming from the top about how to handle a complex situation like treating Duncan. In response to the upcoming lawsuit, Texas Health Resources chose not to comment on any of the allegations. 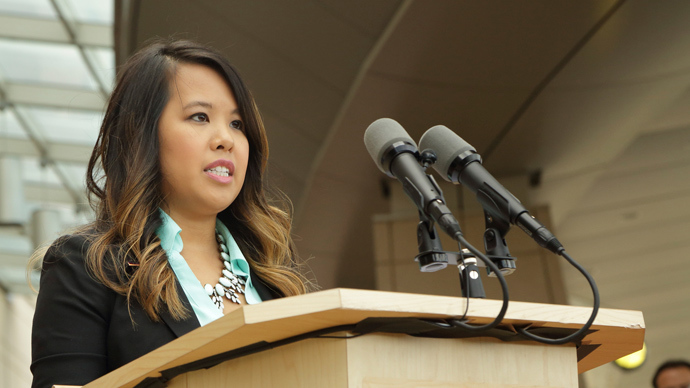 “Nina Pham bravely served Texas Health Dallas during a most difficult time. We continue to support and wish the best for her, and we remain optimistic that constructive dialogue can resolve this matter,” spokesman Wendell Watson said in a statement on Friday. Pham became the first person to contract the deadly Ebola virus in the United States last year. She has overcome the disease and was released from the hospital in October.